#Collaboration ‬ – honing the space for more truthful mutual exchange. this year, noted disabled dance artist, Alice Sheppard and i have committed to be in thoughtful collaboration. A collaboration upholding truthful exchange. One that calls us to have respect and dignity for the body in the work and the process. Allowing each other to be fully present and empowered. We don’t call each other out; we call each other closer to the mission. A collaboration that builds community beyond ourselves and the work. soon, curating an evening through Dance Union . Sunday, November 4th, at 7:00pm. experimental compositions of decomposition. artist-generated physical response works to the curated theme of decay. Dance of Decay: Compositions of Decomposition. yielding an evolving composition of decomposition. Author Barak adé SoleilPosted on October 8, 2012 Categories BlogrollTags anthony romero, ayako kato, baraka de soleil, carolyn alvarado castillo, composition, curation, dance, dance of decay, dance union, decay, decomposition, experimental, installation, nurse log, onye ozuzu, performance art1 Comment on Dance of Decay…evolving soon. It’s been a little over a month since my mother has passed. One of the many things i miss is her dancing. Unafraid to release all inhibitions, she ‘cut many a rug’. Of any event this week mom would have loved to attend, it would be “Dancing Under The Stars” : a special evening presented by Chicago Dancing Festival in partnership with Chicago SummerDance. Partnership is the theme of this event. A communal partnership. An intimate partnering. Mambo style! Arriving a bit late, i was compelled to catch up on the ‘lesson’ being taught by Del Dominguez & – his partner for this instruction – Laura Flores. note not Laura Flores, the acclaimed Mexican actress, but the equally charismatic co-founder of Mixed Motion Art: a space for dance & fitness. Actress Flores (whose birthday happens to fall on the same day as this event, the 23rd) probably wishes she could Salsa, Mambo & Cha-cha as well as dancer Flores! Back to the lesson. 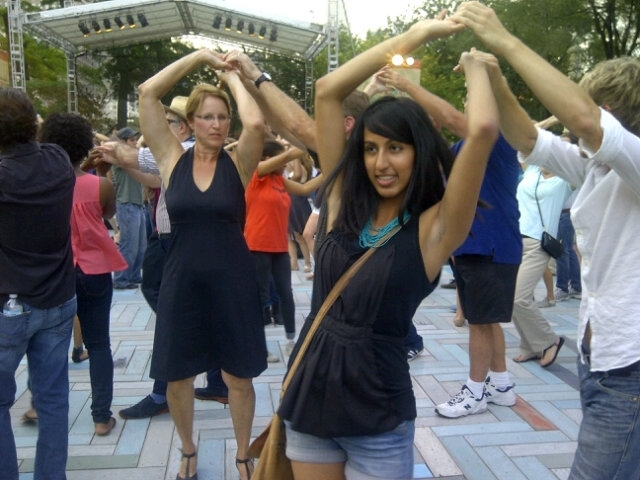 Throngs of folks peppered the specially-laid outdoor dance floor, eager to learn the ‘basic step‘. The basic step in this case involves stepping forward on one foot, stepping back on another with some transitional lift of the feet between or as Del would count out “1-2-3, 5-6-7”. Singular at the moment, each person was assuredly focused on capturing the footwork. All ages represented. All skill levels. All determined to get every nuance of the “1-2-3, 5-6-7”. Even in their seats on the outskirts of the dance floor, people looked on and ‘moved’ with the dancers. “How we doing?” Del asks to the community. Smiles, giggles, some shaking or nodding of heads and further explorations of the step were the response. In protocol with social dance forms, often one is taught first the ‘vocabulary’ or basic step, before the more intricate moves are added. Sans music, he and Laura continued on to ‘coupling’. 1-2-3, 5-6-7. the momentum of the steps pick up speed. and so does the intricacy of the partnering. “1 of 3 things could happen…” Del cautions when instructing on how the man(leader) would turn themselves after guiding the woman(leadee). 1. You could ‘break’ the shoulder. 0r 3. Lower your hand. the mechanics of the mambo. “Earl” the “Maestro” slows down the tempo with a ‘Cha-cha’ inspired rhythm. The instructors suggest that this is the entry way to the Mambo. 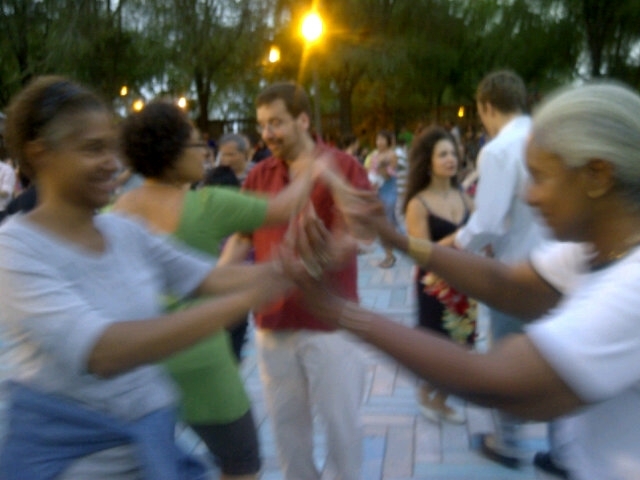 Soon the communal dancers will be able to “jazz it up!”. As the instruction comes to a close, the partners move methodically and sometimes mechanically through each ‘lesson’ of the hour. An accomplished & beautiful communal exchange has occurred. 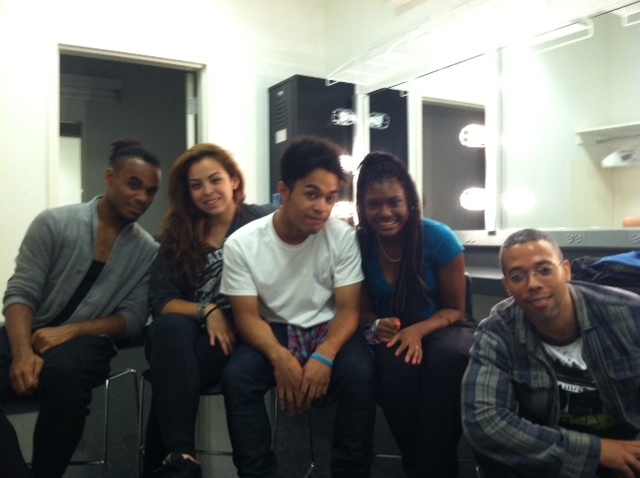 Everyone who has been witness or dancer inside this experience has something to take away. Del and Laura leave the platform. The dance floor clears out. People move off to the side to partake in food or beverages, rest or persevere through the steps; hoping to get inspired by the dee-jay set that will take place momentarily. During this transition, genderization of the partnering is eschewed in favor of fun infused playfully-coupled dancing. Lips pressed, one young woman, relentlessly practices with her female partner; finding the connection to the internal rhythm of the beat to the steps of her feet. Incidental moments of heel tapping betray the connection, but she is determined. Others break from the moment by goofing off and mock dancing movement from other periods in time such as the ‘Jerk‘ or the ‘Robot‘. An African contracted poly-rhythmic movement exchange happens not far from eyesight, while – gum in mouth- a flustered young woman still works to get the “1-2-3” of the Mambo. Around her people picnic. 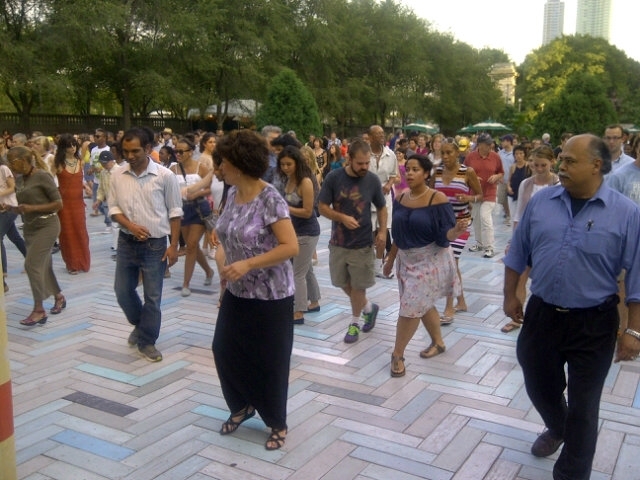 Less cellphone than engaging one-on-one or group live conversations permeate Grant Park’s Spirit of Music Garden. Some choose to ‘catch up’ with each other and recollect on past ‘lessons’. “It didn’t matter if you messed up” Nikki points out. 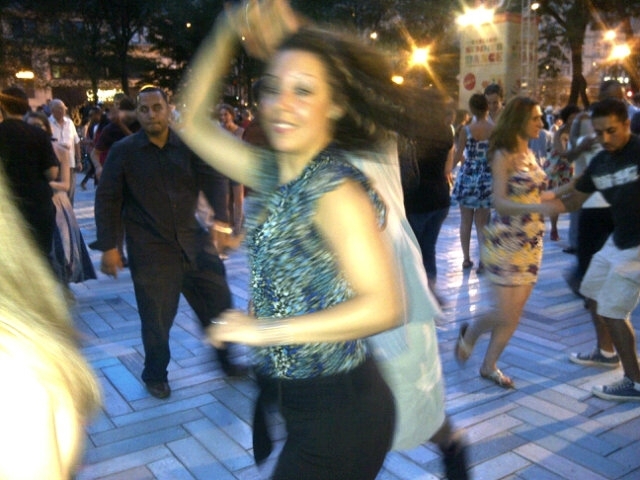 A resident of Auburn-Gresham, she brought her aunt tonite to share her love of “Latin music” and of course to dance. Nikki got “hooked on dance” watching ‘Dancing With The Stars‘. This is her 2nd time coming to SummerDance. i ask if she has heard of the Chicago Dancing Festival and is met with an ‘of course’ look; schooling me on when and where the upcoming event – Celebration of Dance – will be. Rosie, Nikki’s aunt, lives in Walnut California, famous for Disneyland…”well I am about 10 minutes away”. She reminisces about dancing with her husband who has passed away some years ago…loving how they took cruises together and “made fools of [themselves] at the disco lounge.” A moment passes. In my mind some tears release. We take in the late comers to this event; though they may have missed the lessons, these people are ready to dance! With smoldering looks and summer crisp linens, one man saunters onto the floor, inviting into this festive atmosphere exciting coupled possibilities the evening shall bring. The music emerges and the dance floor is becoming alive again. “She looks like she wore her salsa shoes [for this occasion] and dress” Rosie observes. Before long, niece and aunt take to the floor and dance. “1-2-3, 5-6-7” Who needs a ‘4’ or ‘8’ when you are enjoying being with each other as these two are. i am reminded of my mother seeing them inside their joy. Another moment passes. real tears are released. For Paula – one of the last people i encounter before heading back home – “there is no better backdrop than Michigan Avenue or being in good company” in speaking on why she came to ‘Dancing Under The Stars” or referring to co-worker and friend Ade; who sits and ‘fans’ her in between her dancing ‘shifts’. It was lovely to capture Paula in her mambo glory, as a fitting exit to my time here. Paula in her dancing glory. The dancing was far from over. The night seeming to have just begun. And the stars have yet to arrive. i travel to my apt heart full of the treasured wonder from witnessing the evolution of this dancing public; from just a basic step to meaningful and intimate partnering within an expansive communal force. There is a continuum…this continuum places within our reach: young people, elders, black, white, mixed, Asian, Latin/Hispanic & all of the above, dynamic & virtuosic, poised & sophisticated beings. All on the same stage. A world class stage. For all to see. And feel deeply what they saw. And tell others what they love. How they loved experiencing a reflection of their city expressed through the dance panorama that took place last night as part of the Chicago Dancing Festival. A reflection of Everyday Chicago articulated by Everyday Chicagoans. The dance eclectic? Yes: hip Africa post modern contemporary release idiosyncratic balletic cha-cha lyrical character defiantly undefinable. The dance electric? Most certainly. Like static cling, it clung to us. Hair raised on arms at times. Defying gravity. Residing still within my recesses. It begins with a Touch of Soul. Because that is how the evening began. And what a beginning…the dancers eclectic, their dancing electric.